hello, here’s two journal entries together, and a short reflection on how it is going as I wrap up here and get ready to head out on the road again for a while. I'm actually sick right now. It doesn't happen often, but I am only human. It is just hard to have a positive attitude these days. But I just put my head down and keep pushing, I am used to the going being hard, things not working out, so much bad luck, just being alone day after month after year, no one to share it all with. 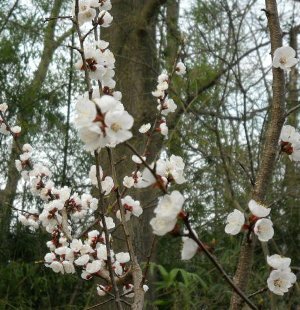 No one to talk to of plans and choices, doubts and questions, and share the bright moments in the music, or the sun on new apricot blossoms, and the green shoots of another Spring. Sometimes it is funny, sometimes it isn’t. I have things to do, though I leave here with much undone. But I'll be back, and I’ll get it done, like so many hard jobs before, on a long hard road. Because I do what I say, always. I decided to skip the 3-1-10 journal entry because there was just so little to report on, no new video, and I was so busy and tired that even as I tried to write what I did below, I became a week late. So I decided to wait. Though the situation is not much different now, the truth to tell. I'm feeling pressured running late like this, and its hard to make the journal a big priority yet, since I am really just trying to keep it perking until life gets more interesting, and when this can be the critical showcase for all the video content I produce. Even this mid-month journal isn't finally set to upload till the 21st of the month. Pretty crazy. But I've been trying to mixdown some videos to add to it, pulling them from the from the DV footage I'm archiving to DVDs, another slightly distracting chore, but a way to make progress as I keep the computers busy while I'm out working in the yard. What I mixed down is music clips from 2005 and 2006. A "Origins" clip where I'm playing a new song for the first time, still unfinished, late at night on a dock after a long hard day. A jam session in Florida soon after, though its a solo clip, since I couldn't find the people for permission and to credit now if I used them in a video. Finally "e;Shenandoah" from a main stage performance at the State Fair in Alaska the summer of 2006. Though what I am really struck by how much great behind the scenes footage I have, shot intending to continue the tour journals I made in 2000, but never being produced except for family and friends. Then, the internet was still not interested in video, I had other things to worry about, and the internet was basically useless as far as bottom-line survival was concerned, This was a decade where I had to focus on what worked, and the internet didn't. Though I maintained my presence, and kept adding to the site, but the video stayed as raw footage. Still, as I incidentally see a lot of the old DV footage during the transfer process, it is the behind the scenes video, that seems the most interesting, the life behind the music like in the AK2K tour journals, and the events unrelated to music that took up so much of my time, so I really performed very little, like raising my sunken sailboat in 2004-2005. I really want to stat mixing down those clips into videos. Maybe that is next, as I have enough performances to give a good example of what I have done. Though there are probably some cool performances left in the achives, I want to start telling the story behind the music again. I’m also stuck by the fact that the selection of music clips seem limited. Sometimes because a lot of the raw footage just didn't come out well for one reason or another. 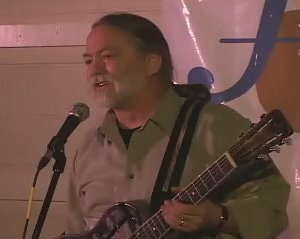 Also, I can only post the tradtionals and originals because of the royalties issue, and they really make up a small portion of my performances as a modern American Folksinger. Also, I keep playing for different audiences, so I usually play them the songs that are peaking at the time, my best, so the performance videos repeat the same songs, changing only slowly. The bigger issue though is how to make the effort to use the internet justifiable. I have to wonder about this journal, and the web site as a whole, which has absorbed so much time and energy, and in the end, I haven't finished a new CD, while the money from selling that Alaskan gold, intended for the recording effort and buying new CDs, has run out. The practical fact is that I have to get on the road again, and find some place to play street music, so I can just survive. So, I sink my last money into repairing the van and get ready to roll. "Doing more" is the plan, but I have to deal with the short-term economic realities as well. Which means I don't know when I'll get to mix more video, once I get back on the road. We’ll see. I have to decide whether to even take the studio with me, or leave it safe here. I may take it, just in case, but I don’t want to expect anything. I only have a couple months. It just isn't a priority, and I have to focus on priorities. And I can't afford the next step to a mobile platform, and the desktop sceneario is difficult to impossible on the road, with extremely limited internet access and computer time. It may be I'll go back to my old life for a while, collecting raw footage, playing the street, living on the road out of the van. That worked for a decade. I'll be back here for about 6 weeks come summer, but that is hardly time to do much more than bounce, before I'm packing to fly off to Alaska and the West Coast. It may be October before I can put serious time into the internet and video again, and into "doing more" with the music. That is still the long term reality. I still believe in the concept, and the future potential, of the web as a venue, as a supportive audience, as a tool for productive relations with promoters and venues, for booking gigs and tours, and for collaborating with oher musicians. But it isn't happening yet, and I can't keep on this way, I have just ran out of time and money without getting something productive happening. 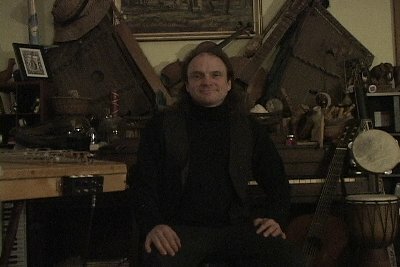 I hope that eventually I can afford the time to use the web, which has kept me making this effort to put myself and my music on the web, and contribute to the web scene since I learned html in 1994, started my website, started getting into digital music, both recording and upoading, then digital video by 1999. But in the end, I am still a poor independent musician, and I have to do what works, and make a living, and play for people. Though I may try for gigs, it is too late to try booking fests, except maybe for summer, and while I'll try for gigs, even that is so often a waste of time, compared to the street, which may be hard and slow, but it works, and I can count on it, despite all its shortfalls, from the weather to the cops to the difficulty finding a place I feel comfortable playing. People always ask me what I am doing playing on the street when they just thing the music is so great. I can’t explain to them the realities of the American music scene for independent artists. The fact is, I don't have other options, there are few venues, and they don't pay much if at all, many good local artists with better connections than me, and I long ago decided I'd rather play music on the street than not play at all, or get a day-job so I can play for venues that don't pay enough to really support artists. I have to play for the venue that is willing to support my music, that I can count on to pay the bills, and that is the street. The people always are glad to listen there, happy to have met me, give me a great response, and are more than willing to contribute. I have a great reaction every where I play, but the street is the only venue that I can count on to pay the bills, and it often pays better than most venues, despite its many drawbacks in stage quality, and all the problems with the negative side of the street, the cops and criminals, the panhandlers and people with negtive attitudes towards street performing. But like all the poor folk, in the end, I have to face reality. I made a serious try, and made some major efforts, but I have to go back to what works for a while. After that, well, we shall see. I am committed to doing more with the music, and I keep my promises, I just have to pay the bills first. 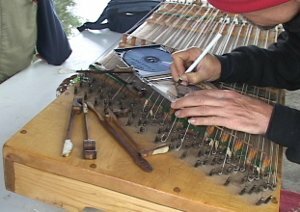 Then I’ll get back to it, recording, dulcimer building, producing videos, working on the website, trying to make it work in a real sense. The reality is if can out-compete the street on a practical level, then I’ll focus my time and energy on it instead, because I do what works. But for now, I can’t, that is the simple truth. One must eat. It is funny, I went out last night to an new open mike, try to make connections, see if it is a potential venue. The crowd, the MC, and the manager all were very clear they were very pleased I had come, but in the end, I spent money on gas and a cup of coffee, gave away two CDs to the manager and MC, and I could have made $100 if I'd spent the time going out to play on the street instead. I could really use $100 right now. That is the reality I have to face and live with. So it goes. I wish and hope I can change it, but at this point, I am running out of cash, and that, like other poor folk, is the bottom line, the end of the rope. I am and have always been aware of how lucky I am, that all I have to do is go out and play on the street to survive, unlike a lot of other poor folk, who often have nothing so good. I am very grateful for the street, make no mistake, and the people everywhere who have stopped to listen and have been glad to support me. As always, thank you, and my apologies for being away so long. It is incredible to think that I am still dealing with the snowstorms a month ago, but it is true. Though much of the work is done, today I spent an hour or two up a ladder cutting off the broken tops of a couple big shrubs, 2 inch diameter trunks that just shattered. I have a pile of brush in the back bigger than the van. Though the snow has almost melted, just the remains of the huge piles left, and the bulb flowers, crocus and daffodil, are pushing up everywhere. Spring is almost here. But it is still freezing in Florida, and there is still a lot to do to get out of here, all delayed by the snow. 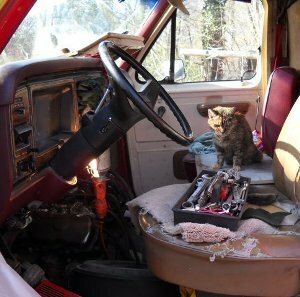 I am working on the van, trying to get ready to go. I had a fuel leak that allowed air into the system, which meant the fuel lines drained back into the tank, forcing the engine to lift the fuel all the way from there before it would fire, often more juice than my old batteries can supply, forcing me to recharge and try again. Well, it has gotten worse, so I had to try to address that while the van was cleaned out and I could remove the engine access cover. The leak was pretty obvious once I got the cover off. Now it is running into March and I am waiting on parts. It is the old story of my life, trying to keep an old vehicle alive, repair by repair, always something. Sometimes literally limping or running a wild jury-rig to get to the next place I can stop and work, whether just a pull off or my next destination on the circuit. I have made runs of thousands of miles that way, many times. Not fun, really, but one of the prices I have to pay. And generally, I let all this slide while I focused on the music and the house. It is also typical that I go to Florida and repair the next thing on the list for the van. Last year it was a new rebuilt steering box. I am terribly frustrated again, of course. I stopped recording because I thought I was leaving. Now I have been delayed and delayed, I am a a couple months into the year and have made almost no progress on anything, since I am half-packed and keep expecting to go any time. This type of limb has eaten up a lot of time over the years, caught between places, unable to get away, unable to start on anything till I do. At this point I am thinking about giving up taking the studio down south since I'll only have a couple months there. I'll just go back to my old life and look for a street scene and make some money. The fact is that while I am committed to doing more with the music, it doesn't pay the bills and the street does, I can count on that. And I can play for people, as always. That is why I stayed there so long, I played for the most people with the least hassle that way, and that was my goal, to play for people. The street worked, and I was right there face to face with my audience, sometimes just one person, though often a crowd. Still, it means putting all the music projects on hold once again. Then I'll have a few weeks back here before I head to Alaska again. SO there's a good chance nothing will get down this year, unless I do it in November and December. And another year will be gone. Pretty depressing, but I don;t see how to get around it. I have to go make money, I have to go keep up with responsibilities. Maybe I can skip Alaska, but selling my saved gold is what is keeping me afloat, and I have a commitment to Dave if he is ready to dig again. The fact is, I can only do so much with my limited resources. I wish I could just work in the studio, but I can't even seem to get started without something coming up. And I am just dying to play. I went out to a possible venue and played their open mike. Once again, it was a strange scene because I am, well, maybe too good. It embarrasses me to outshine people, one reason I don't go to open mikes. I have to wonder what I am doing there, when I should be performing somewhere, even it it means going back on the street. At least there I get paid. Though it may be a potential venue, and I met a sting bass player I might be able to collaborate with. In the end, everything is a distraction from moving ahead, it seems, and finding a new road to travel on. Like right now, I'll leave this, and skip it till mid-month, maybe I'll have more to tell, and get to work on tuning the dulcimer so I can try and produce some video. I got it set up last night and started doing sound checks. I have it set up with the good diaphragm mike feeding directly into the camera to get the vocals. But my hands are pretty stiff and sore from all the yard work I've been doing last few days, a lot of splinters and gouges. During the video check clips, I kept dropping the hammers because my thumb has a bad jab in it. And even now, I work outside, run around ordering parts for the van, get back and eat, shower, now it is almost 10 pm and I'll have to tune for an hour or two just to start. So it goes. All I can do is keep trying. I am still working on the repairing the damage from the storm, though I have also slipped into the Spring chores, things I have to do since it will be summer when I return. So I prepared the garden, raking off the winter leaves and spreading mulch, and planting peas and mustard greens. I raked off the small meadows I've left in the yard and pruned the fruit trees, and transplanted a few final plants around the yard. Move the indoor houseplants outside for the summer. That will be it for this year. The last several days have been spent on the final major repair from the storm, the massive rosebush hedges whose arbours collapsed under the snow. Luckily, I was also clearing out the broken bamboo so I had plenty of material for new arbours. But it is a painful bit of work, no escaping those thorns in the long run. Tomorrow I should finish the roses out front and I'll be done. 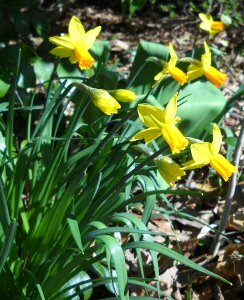 The crocus and daffodils are starting to bloom. It reminds me of how many flowers I have planted here over the years, but never been here to see them bloom, from these early Spring bulbs and fruit trees, to the roses themselves. I have always been in Florida. And I should be there now. I am pretty late again, but everything is in flux these days. I made a mistake focusing on St Augustine and Gainesville, I think. Though they may work for Late April and May, I really need to look at south Florida if I am going to work, or a major city with indoor gigs, not the patio scene of a tourist town like St Augustine, unless I am down south. I went online and searched out some musician's networks down in the Tampa area, and I can look at Orlando. I may take a run down to south Florida, but without the boat it isn't really practical, since it is illegal to sleep in your vehicle down there, and of course, everything else is expensive or full. A major rip-off bought by the hotel-motel owner's association, county officials sell out cheaper and easier than state and national ones. My actually thoughts are that I have to move forward, through this period, not waste time on places I am not interested in the long run. Specifically, this means I might focus on going to South America in January/February next year, after stopping to visit Dad, then visit for April and May afterwards. That is the direction I want to go, international touring, and I have to get started, somewhere. Maybe I could go somewhere else in that period, whatever works out best as I start looking into it. The fact is, I make things happen, so if I decide I am going, I will. Though that again gives me a pretty short window to record the CD next fall, October through December, but it is possible. The problem is all the distractions involved in being here, trying to do so many things. The last CD was recorded at my friend Joe's cabin in Montana, where I had nothing to do all day but record, unless I wanted to take a walk. I somehow need to achieve that same single purpose focus for a while. But for years I have had to put the recording on the back burner as I dealt with emergencies first, then the long term plan where I worked on the house first so ma could enjoy it. 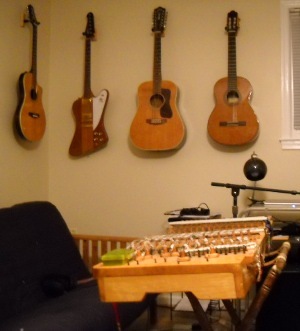 Now I am supposed to be focused on the music, but I let the website and the dulcimer take priority over the recording at first, then just as I finally get started, I injure my shoulder and everything grinds to a halt. It has been quite strange, actually. I have been transfering the DV footage from the archived tapes to DVDs, both for a secondary archive and simply to make them accessible. It is a long process, but I have ended up reviewing, reliving, a lot of the pas few years as I watch the clips, or just sort through them. I created a month by month calendar for the last decade so I could catalogue the tapes not just by date but also by events, a trip to Alaska or raising the Hurley. But it also made me look at the last decade and really see where all the time has gone. I was dealing with one emergency after another, working at full capacity. I did some pretty incredible things, like raise my sunken sail boat. But I also had face that I lost years dealing with someone else's irresponsibility, the person who's boat sank mine, for which I never got anything. And in the end, neither boat is useful again, yet. The Hurley is on a trailer here and sits, after consuming so much time and effort when I had to deal with it. And the steel boat is battered and I sailed it up with half a mast, and frankly wonder if I should even keep it at this point, if I have a use for it in my life any more, or perhaps whether I have the time and energy for it and I would reduce the pressure and the burden on myself by passing it on. At every step I did the right thing, I was responsible, and capable, and did what I had to do, from dealing with the boats to nursing ma through cancer. In fact, I am amazed at how much I did manage to accomplish, recording the one CD, finally getting wound pick-ups, doing the massive repair-rebuild on ma's house, and making the trips to Florida and Alaska, and playing just enough to stay afloat, though the music suffered greatly all told. I have never played so little as since I decided to "do more" with the music. Funny. And I have really only managed by selling all the gold I dug in Alaska over these same years. But in the end, I still have no CD. Though I am pleased by the latest videos, and how the website is coming together. It is what I need if I am going to focus on touring internationally, and even nationally, since it has to be my promo package. Even now I have set up the video studio again and am trying to produce some more studio video before I head for Florida. The "meet the artist" interview and some studio performance videos. I've worked on the yard as the rain was coming down steady. Good for plants, not so much for auto work. The fact is, the van can wait a few more days, but Spring is here, the flowers pushing through the leaves, or trying, and they can't wait, all the plants so recently buried in snow are charging out of dormancy as the temperature hits 60, and the Spring rains come, and I have to deal with it or forget it till next year. The roses would have been much harder to deal with after the started growing out new canes, leaves, and were covered in blooms. But enough, it is all done. Tomorrow I start on the Van. Soon I'll head south. But now I am both repairing the snowstorm damage and doing spring yard work since I won't return till summer. 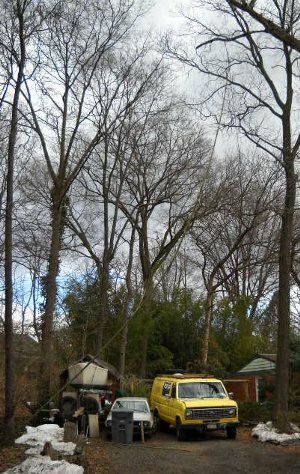 There’s things I just have to take care of, like a seriously big dead branch high over the driveway right where ma parks her car. I tried climbing but my shoulder is still not ready for that, I just hurt it trying. What to do? But I woke up in the morning and thought of tying two bamboo poles together to lift a loop up to the branch. It was tricky, but I got it and snapped the branch off with a good haul on the rope. It was scary how easy it was and how many days I’d been looking at it, finally parking the car out on the street if the wind got gusty a or strong. As I tell people, my schedule is to leave when I have checked everything off the list I have to do so I can go, like that branch. I have continued to accept the idea that I won't try to do much while I am down there. The bottom line is I am there to see Dad, and everything else is just extra. 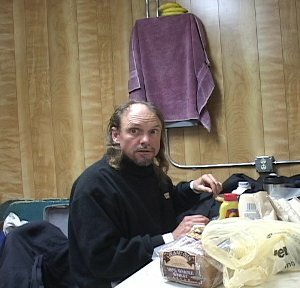 I need to make some money, but haven't had a chance, or more, din't have a firm enough schedule, to try booking anything. So it is back to the street. Though the fact is, that is the thing I have always counted on, the dependable source of income in a pretty flaky and exploitive music business. As I say, when it gets tight, I have to focus on playing for the people who are willing to support me, and that means the street. Though I do great in venues, getting the gig is more trouble than it is worth unless it is steady gig I can work for months, or an exceptionally good festival. Not many of those any more either. Right now I need to focus on what pays the bills, if I do anything at all. Though I do want to take some drives to other areas of the state and check them out, look for a better street scene if nothing else, St Augustine was pretty sad all told. But in the end, I know I can go there and make money, and I will, come May, if I don't find anything better. And the boat is near there. Though I seriously consider hardly playing at all and simply focusing on visiting Dad and working on the boat. Play just enough to pay for gas and food, which won't take much. Focus on moving forward, and getting the boat liveable and mobile would mean I could keep it and start using it to head south with, take it to South America, or maybe the Islands first. That was always the plan, to move it slowly as a mobile base, using it part of the year, returning to move on a little farther each year. But in the end, it is a lot easier to just jump on a plane, as far as getting somewhere. But the boat is great as a place to live, for being some place, especially islands, harbor towns and waterfront tourist towns. When I realised a couple weeks had gone by without me even leaving the house, I decided to focus on getting out to play some before I go, as well as look to the future, and make this areas work, since I have little choice in the matter really. Again, the bottom line is I am here to help out ma. So I went out to at couple open mikes at potential venues. One, at a folk club, didn't really seem very friendly. Another, at a coffee-house/book store, I enjoyed. 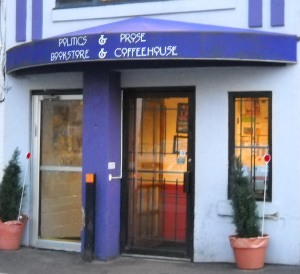 That really is a a familiar place for me, I have spent a lot of time, and played, in coffee house-book stores and they remain one of my favourite places. Finally, just a couple days ago I went an jammed with a local musician, literally a few blocks away, who found me in one of the new musician collaboration networks I have been joining. It was just the two of us, and it went off good. It was just great to play again as well. It always is. I also went a saw an old friend of the family, Scott Ainslie, perform for a new local folk club. This one, Focus, might be a bit more interesting as a potential venue, or maybe not. I never know, so I have to try. But it was great to see Scott, though we haven't met in decades, and really never knew each other well. He used to play at our house, though as part of my older brother's musician crowd, and I was not much involved with their scene. I was involved in my own scene, out of town, mostly, gone weekends and summers. Though I have vague memories of the jams and band practices at the house, which was a pretty common thing at our house over the years. And 10 years age difference doesn't matter much, now. We've been exchanging emails occasionally for years, intending to cross paths, but, well, the last couple decades haven't been particularly good for me. So it goes. It was actually pretty strange how similar our styles and music were, though. Seems we do have the same roots and it shows. It really reminded me about where I come from. The fact that so many people who played in our living room back when I was just starting out myself eventually became well recognised performers, some nationally, some just locally. I makes me realise that one reason I never took my music seriously is because I realise I was that good, because we were all that good, being that good was what was normal for me, nothing special. It really took me decades to realise I was actually that good, because we were all extraordinary musicians, and I just took it for granted, and didn't see it as extraordinary. It is something I still have trouble with. One of the reasons I am having difficulty geting the recording done it because I have to overcome a intrinsic conviction that it really isn't something important, something special, something important, and so other things have to be more important. Anyway, I took my video camera and got a good video of his show for him, the other main reason I came. Spent a few days processing it, all with Linux this time for practice and because I didn't intend to mix or title it, just capture and trim the clips, and convert them to flash files sized for YouTube. I was able to give it to one of the organisers to give to him as he stopped and did a workshop for them before he headed back north and home. I also went to meet the organisers, and passed on a CD. I should try to get to their jam as well sometime. 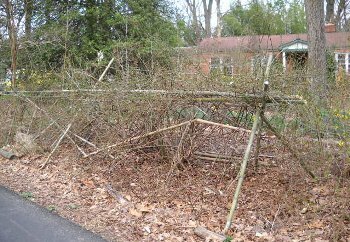 Today I came close to finishing the last major repair from the snowstorms, replacing the crushed arbour underneath the last and biggest rose hedge, the one out front, carefully levering the roses off the ground, propping them up and cutting out the tangle of dead and broken canes to untangle it somewhat before building the new arbour beneath. 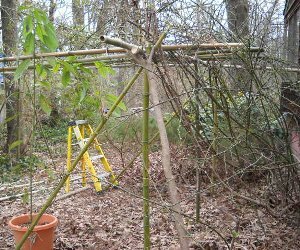 I've been able to clear a lot of the shattered bamboo out of the grove in the backyard in the process of getting pieces for the arbour. And I've gotten scratched and punctured a good bit, but the roses are lovely. Though the truth is I have seldom been here to see them bloom, or any of the flowers I've planted here to please ma, for decades I've always been off in Florida playing. When I finally saw them a couple years ago I was surprised at just how massive amount of roses there are, all around the house. Even now, I am surprised at how many bulb flowers are coming out all over the place, though I planted them at one time or another. Like last November, for ma's birthday, I bought a couple bags of bulbs and planted them. With the parts finally here, I'll start on the repairs to the van, and after that, I just have to pack up and get on the road. And maybe play a couple places, keep trying to network. I am also going to try and do some more video in the studio before I go. I've done some tests using the big microphone and the sound is good, but I still have to record some sessions, even if I don't process the footage till later. Even if I take the gear with me, there's no certainty I'll be able to set it up, or get around to it, when I am down in Florida. In fact, as I said, the general idea now is not to try to do too much, but ease up and just do what I am there for, despite the frustration I feel at having made little progress on the new CD, once again. At least if I have the video done and on the website, I can start promoting and networking with it, start looking for international connections. My latest idea on that front is that I should find another musician to collaborate with in whatever country I go to, so they can act as my guide, arrange gigs, deal with language and culture, and I can focus on the music. I'd already had the plan to find local musicians to jam with and collaborate with when I got somewhere, and try to produce at least video and possibly a whole CD derived from each country I visit. This just takes it a step further, focusing on that collaboration as a foundation for the entire trip, even what countries I go to, rather than look for a promoter or do it on my own, which could be difficult. In the end, I will just go on my own as have before, in my old habit as a bard, without any tour arranged, and make it happen. I just show up and start playing and see where it leads me. Often the first place I'd play would be the airport itself, and people there would give me plenty of suggestions or invitations to lead me to the next place I would play, and the next, which leads to the next, and life goes on and the time passes quickly, till it is time to go, once again. '’ll visit my Dad, and work on the boat, and play for whoever wants to listen. I have nothing to prove, and won't try to convince anyone to listen to me, there is always someone who does, and is always glad they did. So it has been. So it goes. This entry was posted on Monday, March 22nd, 2010 at 2:11 am	and is filed under Studio Journal. You can follow any responses to this entry through the RSS 2.0 feed. Both comments and pings are currently closed.